To Ice Tarts - Mrs Penrose Take a little yolk of Egg & melted butter beat them well together, & do over tarts with a feather, & sift sugar over them just as you put them into the oven. 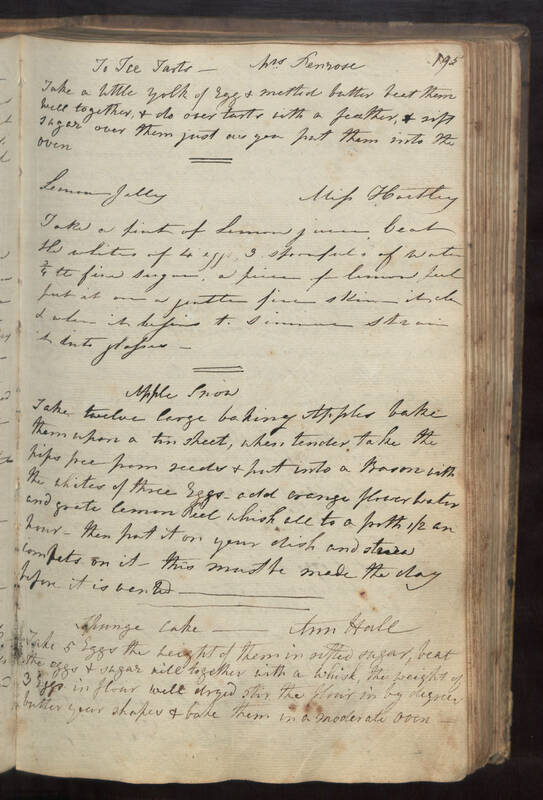 Lemon Jelly Miss Hartley Take a pint of lemon juice beat the whites of 4 eggs, 3 spoonfuls of water 3/4 lb fine sugar, a piece of lemon peel put it on a gentle fire skim it clear & when it begins to simmer strain it into glasses. Apple Snow Take twelve large baking Apples bake them upon a tin sheet, when tender take the pips free from seeds & put into a Bason with the whites of three Eggs, add orange flower water and grate lemon Peel whisk all to a froth 1/2 an hour, then put it on your dish and strew comfets on it, this must be made the day before it is wanted. Spunge Cake - [Ann?] Hall Take 5 Eggs the weight of them in sifted sugar, beat the eggs & sugar will together with a whisk, the weight of 3 Eggs in flour well dryed stir the flour in by degrees butter your shapes & bake them in a moderate oven.